Play is the occupation of children. As kids grow, it is through play that they develop their sensory and motor skills through exploration and discovery. Play is used to optimize engagement and participation to strengthen the development of sensory, fine motor, gross motor, core strength, motor coordination, motor planning, visual and handwriting skills. You will find us rescuing animals in our treehouse room, fighting dragons in the castle room, returning animals that escaped from the zoo and climbing through the rainbows in our lycra room – just to name of few fun games – while we build these developmental foundations. When development of functional skills is challenged it is important to consider the sensory foundations on which motor skills are developed. Sensations are the first things that children develop. The primary goal of the first few months of life is to take in the sensations of others and the environment and to eventually respond with an action (motor control – first gross motor and then fine motor). Taking in the sights and sounds of early social interactions and moving to respond to them sets the stage for all other motor skills needed to successfully participate in daily life. With this said, we realize that both sensations and relationships underlie all development – so we start there with our evaluations and treatment. Motor skills can be learned via repeated practice, however, strength is found in the discovery that comes from sensory and motor exploration. Practiced fine and gross motor skills become splinter skills that are often not generalized and maintained. Giving a child the opportunities to explore how they can move their body in different ways through guided play allows them to discover the best ways to respond in the moment with precise motor control. This discovery is the beginning of strong foundations on which other skills are supported. It is the roots and trunk of their developmental tree. 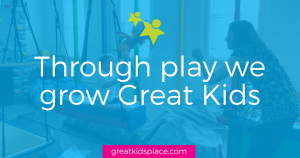 Through play we grow Great Kids!